Two years and two albums later, Gerry Rafferty was out on tour again in the UK. I saw him when the tour called at Newcastle City Hall. 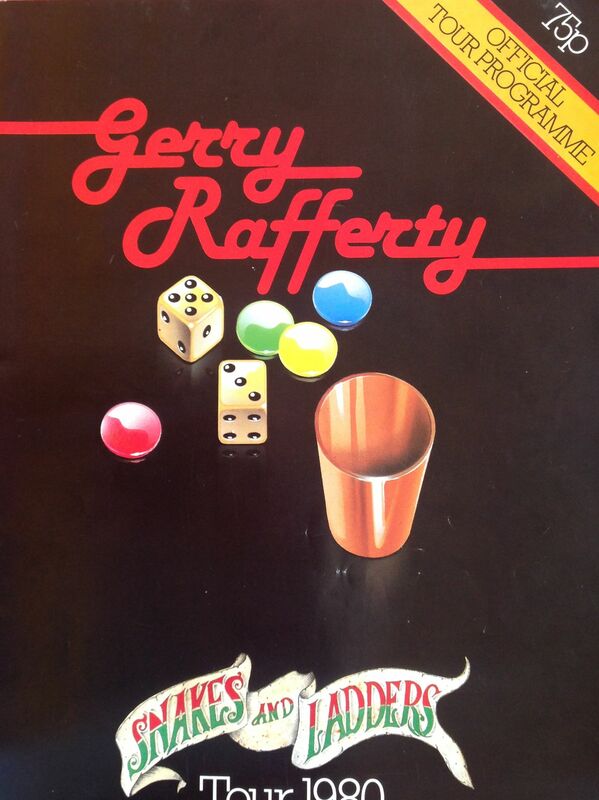 The massive success of Rafferty’s “City to City” album was followed by “Night Owl” in 1979, and “Snakes and Ladders” in 1980. The title track from “Night Owl” made the UK top ten, and the album also include the hit “Get It Right Next Time”. The set consisted of his hits and tracks from his four solo albums, and was another enjoyable evening spent with a musical craftsman. Support came from Richard and Linda Thompson. Richard Thompson had played on the “Night Owl” album, and Rafferty personally financed the husband and wife duo’s next album, and helped look for a record deal for them. This was not successful, although several of the songs were later re-recorded and appeared on the critically acclaimed “Shoot Out The Lights” album. Rafferty was a craftsman and a perfectionist; that can be seen in his recorded output, and was also evident in his live concerts which showcased the unique way in which the singer songwriter successfully blended pop and folk rock. However, fame and live performance did not sit well with Gerry Rafferty. He found the linkage between success and celebrity difficult to handle and his live performances were few and far between after his 1980 tour. The appearance of “Stuck in the Middle with You” in Tarantino’s 1992 film Reservoir Dogs brought Rafferty and his music back into the public eye and introduced a new generation of fans to the song. Gerry Rafferty sadly passed away on 4th January 2011. His passing was marked by tributes from across the music industry, and a re-evaluation of the massive impact of his songs and the richness of his musical legacy. The song “Baker Street” seemed to be playing everywhere I went in early 1978. It certainly propelled Gerry Rafferty from what seemed to be nowhere to massive stardom within the period of a month or so. Now he hadn’t come from nowhere, and I had of course heard of Gerry Rafferty before that. I knew of his collaboration with Billy Connolly in the folk duo Humblembums, and I was familiar with Stealers Wheel through the big hit “Stuck in the Middle with You”. In fact, I once saw Stealers Wheel live. It was around the time that “Stuck in the Middle” was in the charts. This was at a concert at Sunderland Polytechnic Wearmouth Hall. However, I am pretty sure that it was during the period when Gerry Rafferty was not in the band. He left Stealers Wheel during 1973 and was replaced by Luther Grosvenor, after the guitarist left Spooky Tooth and before he became the crazy glam-king Ariel Bender in Mott the Hoople. The thing I remember most about that concert was just how loud the band were. Its hard to imagine it, given the nature of their music, but it was one of the loudest gigs I have ever been too. So loud that you couldn’t hear the music, and that you had to leave the hall to speak to anyone. The place was packed to the walls and Stealers Wheel were good, but it is the sheer volume of the gig which sticks in my mind to this day. 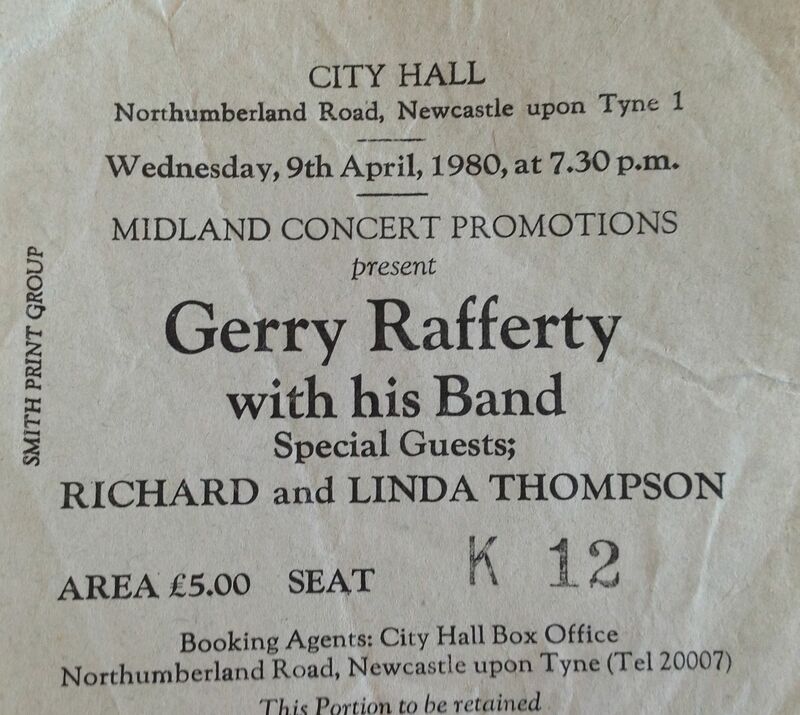 Anyway, as I say, Gerry Rafferty wasn’t in the band that night, so apologies for the ramblings and back to the point of this post. At first Rafferty wasn’t keen to tour off the back of the “City to City” album, but as a result of the massive impact of the single “Baker Street” he agreed to do so, and a touring band, based on the musicians who accompanied him on the album, was put together. The UK tour sold out immediately, although most of the people there will only have been familiar with the hit single. Support came from Scottish folk singer Rab Noakes. The set consisted of the “City to City” album, and a few songs from Gerry’s earlier solo albums. I am pretty sure that he didn’t play “Stuck in the Middle”. 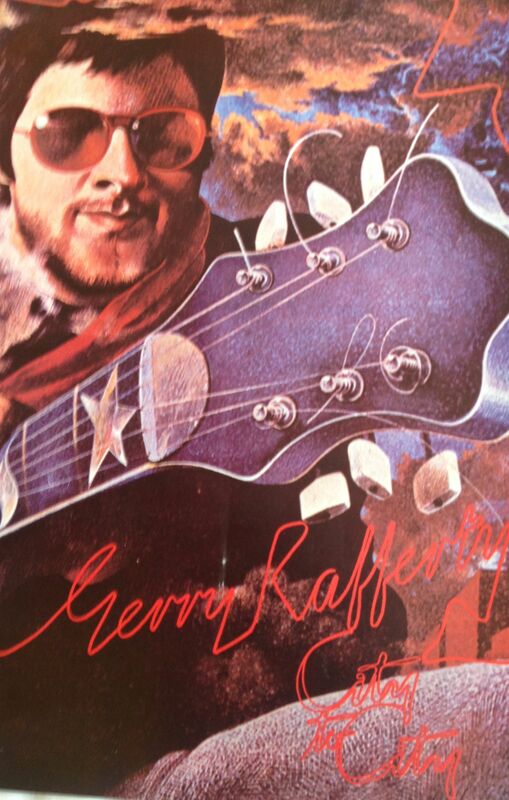 The music was perfect with a certain groove that all of Rafferty’s songs seem to have; when you hear Gerry’s soft, calm vocals you just know it is him. I recall going along only really knowing “Baker Street” and coming away converted; quite a fan of his music. Gerry’s band for the tour were Julian Litman (guitar), Tommy Eyre (keyboards), Jeff Bannister (keyboards), Raphael Ravenscroft (sax and famous “Baker Street” solo), Gary Taylor (bass) and Liam Genockey (drums). Musical production and tour direction was provided by Hugh Murphy who had also worked with Rafferty on “City to City”. 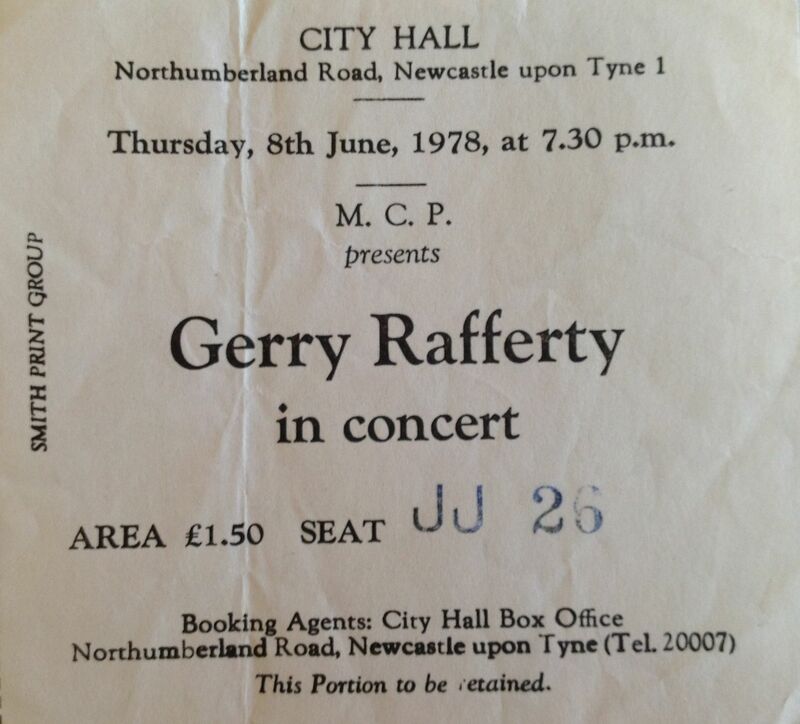 I saw Gerry Rafferty once more in concert, a couple of years later, and I will write about that tomorrow.